Journey Home is an account of a young American's travels in search of God. Beginning from a middle class home in Chicago, the author, still in his teens, begins his journey that takes him to spiritual preceptors of almost all the world's greatest traditions. Wild predators, urban terrorists, mystics, strangers turned friends, appear in a tale of grit, determination and yet humility. Which builds up to mystic encounters in the mighty Himalayas and finally climaxes in a holy town in northern India at the lotus feet of Srila Prabhupada. 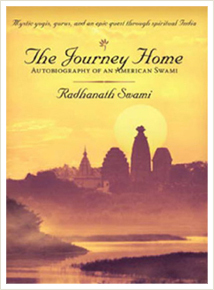 Read more about Radhanath Swami on his site http://radhanathswami.com. To become a member of Radhanath Swami Disciples Network, go to http://radhanathswami.us.